I've got 216,000 on my 2005 Prius. The hybrid battery was replaced at 95k miles because the original owner drove 9 miles uphill to work, then 9 miles back at the end of the day. Then I took ownership. My mechanic says my car is in fanastic shape. I do an oil change every 6 weeks with regular 5W20 and BG's MOA which easily brings my MPG from 43 to 48-58 depending on the road and temps. madmikesmech, cwerdna and Raytheeagle like this. My 2007 just rolled over 200,000 miles today. I'm the second owner and a far as I know it's on the original battery. If owned this car for about 15 months and 2000 miles. I really like it a lot. Hope it continues to run as well as up to now. Mochabuzz and cwerdna like this. My '06 Prius with just over 200,000 miles was re-ended yesterday Kinda upsetting, wanted to be able to drive this car forever, but now with rear end damage, I do not know. It's been a great car. Still on original brake pads. Replaced battery couple years ago. Runs like a top, still getting 46 mpg. Replaced battery couple years ago. Runs like a top, still getting 46 mpg. 12 volt battery or the Hybrid HV battery? 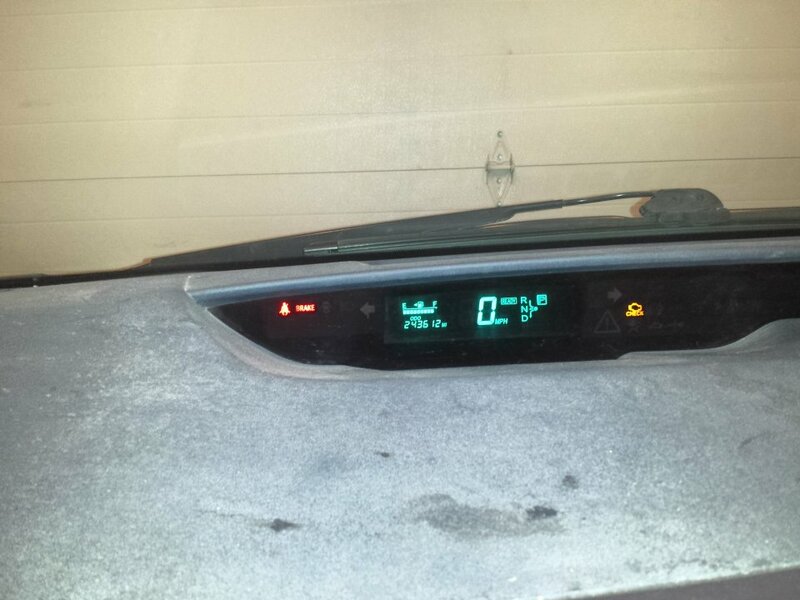 2006 prius bought when new, has now 293000 miles. Replaced the front pads & rotors at 201000 miles, finally was at 3mm, never done the rear shoes. Been religious in changing the oil every 5000 miles with Mobile 1 5W30 synthetic, started using oil by 1 quart every 2000 miles at 210000 miles. First big scare was August 2015 at 250000 miles when my wife had the red triangle of death but it was because the oil level was 2 quarts, so bought her a new Prius C & I started driving it to work. First main battery was replaced with a Dorman unit in November 2017 with 266000 miles. Second Dorman unit was in July 2018 with 276000 miles. Now at 293000 miles I'm in need of another main battery, may go with Dorman warranty if it'll apply otherwise may consider another better battery. Had cooling system & brake system recently flushed by a Toyota dealer. 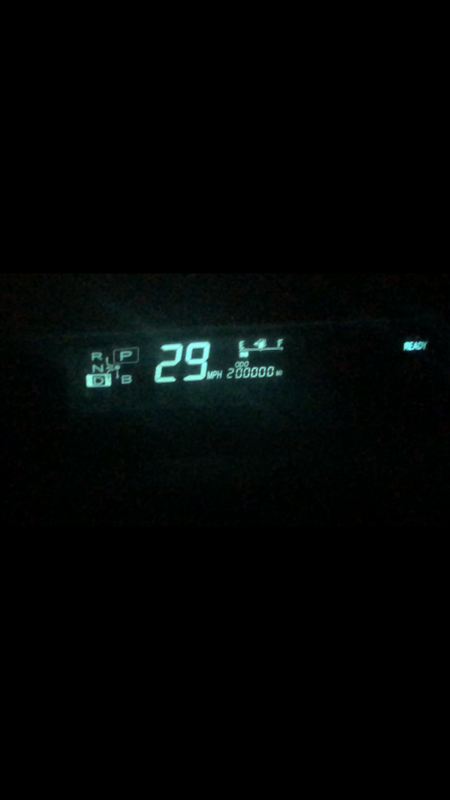 Mine just rolled over 200k last week. Mine just rolled over 200k just before Thanksgiving. Bought my 2008 Prius new in August 2008. 6) How often do you change your oil? Approx 7000 miles. I use Mobil 1 5W30. Buy them when on sale at Costco. Fort the first 120k miles would have the oil changed in a shop every 5K miles using regular 5w30. Switched to synthetic when I started doing repairs and changing oil myself. Have to change the oil drain pan now as the drain plug threads are worn out. Changed ICE and Inverter pumps and coolant at 170K and coolant as well. ScanGauge II mounted on console and I monitor water temp and HV Battery SOC while driving. The gauge helped me when the pumps were throwing error codes. I should be good now hopefully for another 100k miles on the new pumps. I also hope the SOC gauge will warn me when it is time to replace the HV battery pack. On a recent trip to NC, I casually checked with a dealer the cost of replacement Battery pack. The dealer quoted me (verbally) $2700 installed. Not sure if this is quote is reasonable but since my SOC is holding up file, I did verify further. 1) Did you replace the HV battery. No. It get drawn down on the commute up and down the hill each day and I can still travel about 20 miles on a full charge when going downhill using the hill and just the EV battery to propel the vehicle. I live at 8600 feet, drop to 7600 feet p to 10,000 feet and then down to 4200 feet where my office is located a commute of 62 miles each way. 2) Did you replace the 12v lead-acid battery? Yes, twice. Mainly because of my leaving the interior lights on unknowingly. 3) Did you replace the hybrid transaxle fluid? This will happen in the coming week. 5) Your lifetime MPG (if available)? 46.7 MPG winter months and 49.5 MPG summer months. QueenBritt, MilkyWay and VFerdman like this. congrats, Butch! have you had it since brand new? that's a lot of miles. Bought September 6th, 2017 with 145,500 miles at NY auction (I live in Michigan) for awesome deal of $2500 ($2675 with auction fees). Was very clean in/out with leather and seller was a Toyota dealership. I immediately did front wheel bearings (needed badly) and pads/rotors...all filters...new tires (Ecopia)...trans fluid flush....wheel alignment, PCV valve, spark plugs, mobil one.....weather tech mats....Add shipping from NY to MI and tax/plate fees my cost ballooned to probably just over 4k which was still a great deal. I think it is worth $2500-$3000 today. I went with the cheapest wheel bearings money could buy ($58 for both LOL from am-autoparts). I ended up having to do 1 of the 2 about 25k miles later (lesson learned and now I only buy Moog). Check engine light small evap leak P0456 pops on every 4-5 days and that began in November 2017 (used to clear it but now I just leave it on). December 2018 I decided to "diag it" and the incompetent mechanics by my house said it was the fuel filler neck. About $350 spent later it didn't do anything and I have yet to bring back to them for a 2nd diag. By around 190k (45k miles on the Ecopias) I bought a used but still 90% tread set of Michellin Defenders for about $220 installed. And for Black Friday 2018 I got Michillen X Ice for $350-$400 (can't remember exact). So tires, oil burning, and the P0456 are only problems I have had in last 55k miles. I have saved thousands in gas and thousands by owning a zero-maintenance car. No problems with either batteries, did Mobil One every 4k until I started noticing oil burning. Realized probably doesn't matter what brand I use so now I just do the cheapest stuff ($30) every 3k miles. I get 42mpg most of the year but 38-39 in the winter. got 240600 on my 2005,, still runs and drives great except the brake accuator went out and im not replaceing it..PITA and the car is rough as i use it for a handyman business,, but no engine problems,never replaced brake pads ,until i got brake problem,(thought it might fix it),never replaced either battery,only problems at 175k , 2 door locks, 182k inverter pump, 197k a/c evaperator, 239k brake accuator. lifetime mpg (hand calculated) all loged,,50.1 mpg U.S. has had oil changed every 10,000 miles with mobile one full synthetic, never replaced transaxle oil. LikeAPrius and MilkyWay like this. Do they take a $5000 scanner and connect it to the car and check for hidden codes (no check engine light)? Cause it didn't come with a check engine light on. It took months for it to pop on. And there was a time or two when I'd clear the code and would stay off for months. Eventually got to point where it only stays off for 4-5 days. Regarding why they traded it in: The car had severe front wheel bearing noise (and I'm sure the Toyota dealership quoted them thousands to do a $200 job). Plus the tires were completely shot! But they were aware of the evap leak because on toyota-owners I can see they replaced gas cap at some point. Anyhow, the car has been pretty much flawless. I will be pouring PAINT THINNER (Lmao) into the car pretty soon to see if it fixes oil burning (mechanic will follow steps not me). 1. The HV battery has apparently not been replaced. 2. The 12V battery may have been replaced, but I see no evidence. 3. The transaxle fluid was replaced at 130k. 4. The brake pads show no evidence of replacement. 5. I'm getting ~47-50MPG, but I don't know what the previous owners got. 6. The oil was primarily changed every 5K at dealerships or local oil change shops. I change with NAPA Premium Performance synthetic blend. 7. I can't post a 200k picture because it was already beyond it when I bought her. Ended up rolling 200k yesterday, after about eight years of ownership from a salvage title vehicle I purchased with 27k miles for $12,000 back in 2011. The HV battery is still good for now and I plan to replace it with a brand new OEM battery or an OEM one pulled off of a salvaged vehicle that had its HV battery replaced recently. Not yet. I did the EV switch mod and that hasn't degraded the life of my battery like many feared it would. However, I use it selectively. Yes, around Fall 2017. Replaced with the yellow top, never had an issue since then. Yes, every 30k miles. It's too easy not to, you don't even need to jack up the car or move anything out of the way. Not yet. I should probably look into that. No lifetime MPG, but I've been consistently getting it in the low to mid 40's. Since the engine now burns more oil, I keep it topped off and change it every 7.5k miles instead of every 10kmiles. Mobil 1 high efficiency oil first, and now I'm using the high mileage version. I have one but they all look the same. The first two digits have slightly different brightness though, probably from being stuck at their numbers for so long. 3. Rear bumper retainer clips (rear bumper was hilariously flopping around on the last quarter of a long distance trip). 4. Water pump recall WAY back in the day, around 2013. 1. There was a period where I would burn out my headlights more frequently than usual, one every 3-4 months. I bought a bunch of super cheap ones from eBay and kept them as spares, and as soon as I put in those cheap ones they've been going strong for a few years now. 2. I bought the most commonly burned out fuses on eBay for really cheap after losing my ACC plug and almost getting lost in a major city in the south from my GPS and phone running out of batteries. I almost had to rely on road signs like some kind of ancient navigator. 3. Speaking of blown fuses, I bought a small pack of five fuse tip things that go into the power sockets in case one of those blows when I'm driving in the middle of nowhere. Why 10W-30 when oil cap says 5W-30? I bought my 2008 prius with 14 miles on it and she now has 195,000. I took her and my dog on a 2 month road trip. Tinted the windows and slept in the back on a comfortable bed the whole way! It was like having my own private hotel room. -Haven’t replaced transaxle fluid. Should look into. -On my 2nd set of front pads, nothing done to back. -Oil every 4,000-5,000 mi.. I went too long without checking or replacing oil at about 140,000. I had been pushing 10,000 and think I went 13,000.. without checking oil. She was bone dry :-/. As I pulled into the parking lot to get oil done the dash lit up like a christmas tree.. for all intents, she should have died then... but alas.. she didn’t! Replaced pcv valve, chain tensioner, gaskets, water pump. She burns a qt of oil every 800 miles. -the heat shield rattles real bad and we adjust it to try to keep it from ratteling. Thinking about replacing. -just replaced the temperature control valve. I think everyone should do this at 100,000 mi. Wish I had! If your baby is overheating, this should absolutely be done. I’m considering redoing battery pack and dropping a new engine in her. Hoping to get another 20,000 to 30,000 mi before needing to do either, but considering being preemptive. What do you think..? Should I? Should I run battery and/or engine into the ground, then do them.. or get them done and behind me? Which should I do first? Her engine runs rough on cold start, but sounds much better once she warms up. I have no problem dropping a qt in her every other fill up of gas for another 100,000 mi. Just replaced tires and brakes. If I do new battery pack and engine, I’ll be replacing the radio. I want better phone and audio Bluetooth. 374000 km (~ 232000) miles here. 2) Did you replace the 12v lead-acid battery? Only once in 2018 and only because somebody that was using my car for few days got used to leave the keys inside all the time.. Otherwise it would still have the original Japanese one. 4) Did you replace the brake pads? Yes, once. 6) How often do you change your oil? What brand / product did you use? During maintenance (see above), but keeping it monitored as it consumes more oil now.